The Sanitas Glass Diagnostic Scale features a square 30 x 30cm platform of safety glass, with a 150kg capacity. This digital scale features an extra large display with a digit size of 40mm, to provide details of weight, body fat, water and muscle content. 10 user memories provide an overview of the most recent values, while the scale is capable of presenting values in kg, lb and st. The Sanitas Glass Diagnostic Scale presents body values by 0.1% for body fat, body water and muscle ratio, and 100g for body weight. 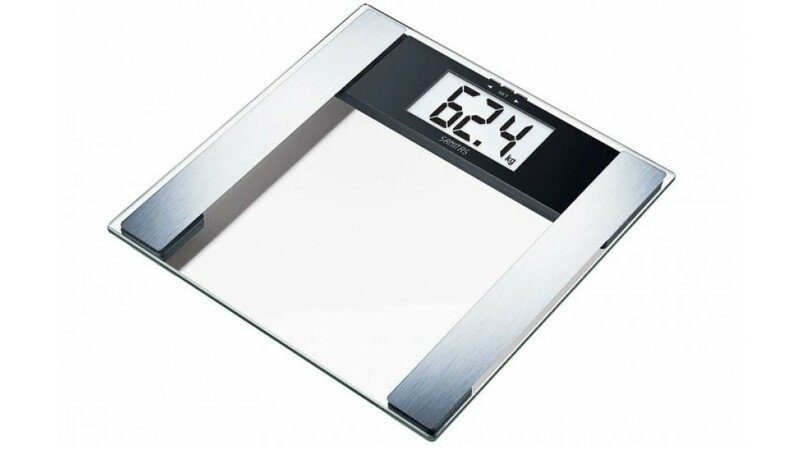 This Sanitas bathroom scale delivers outstanding performance with electrodes of brushed stainless steel, 5 activity levels, automatic switch off and 3V lithium battery CR 2032 included.